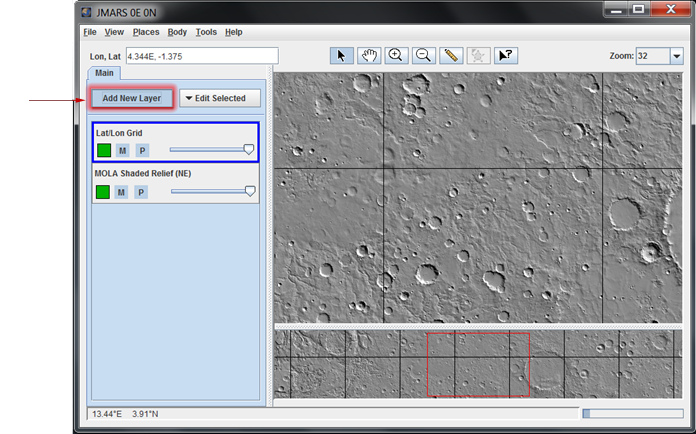 The purpose of this tutorial is to walk users through the process of opening JMARS, opening the Shape Layer and adding a new column that contains data obtained by sampling the particular map. 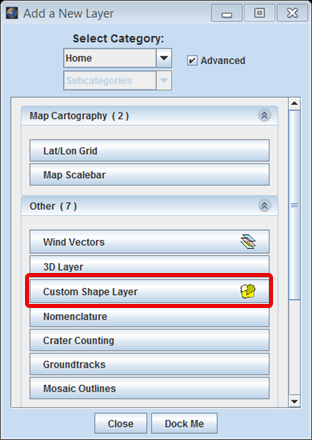 In the Layer Manager, click "Add New Layer" -> "Custom Shape Layer", then double click on the "Custom Shape Layer" tab to access the focus panel. In the new "Edit Columns" window that opens up, type the name of the new column (max elevation) and select its type as Map Sampling from the Type drop-down menu. Click on Add Column. 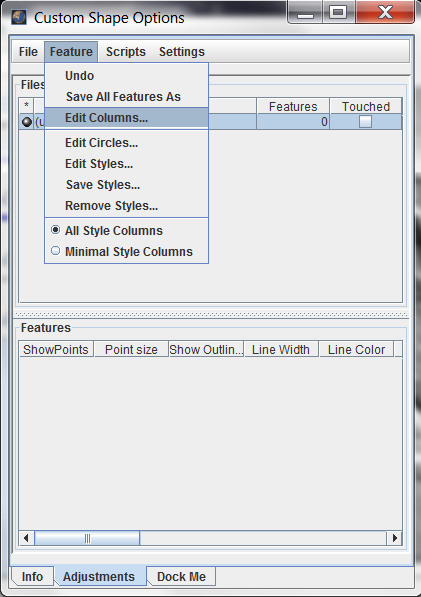 The new column name together with its type appears in the list of columns. The description of the column is also displayed. We are using MOLA 128ppd data as the source and are sampling it for the maximum elevation. So select MAX from the Stat drop-down menu. Click Okay. Step 3: Viewing the maximum elevation under the shapes added. 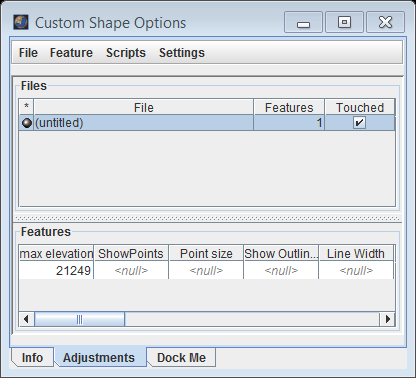 The maximum elevation for each of the added shape appears under the max elevation column in the Shape Layer focus panel. 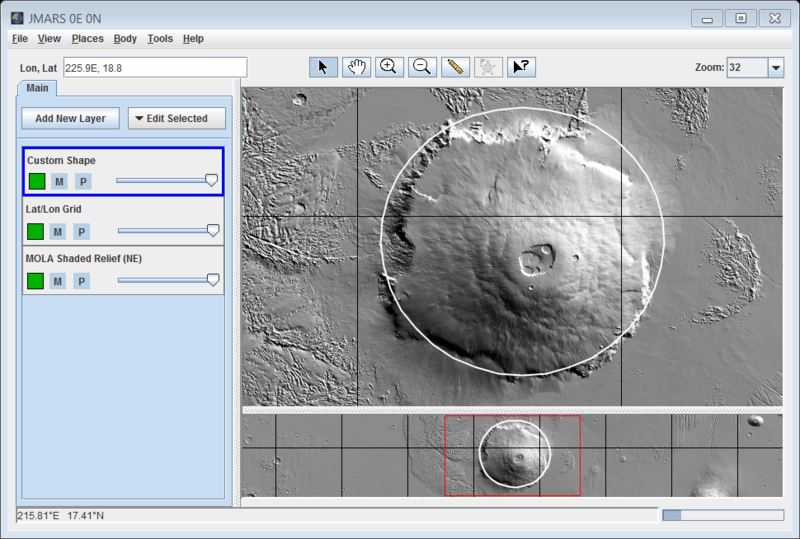 We have added a circle at Olympus Mons (226E, 18.4) and the maximum elevation at Olympus Mons is displayed. Congratulations! You have finished the tenth JMARS tutorial!